In response to such an observation, we took up the challenge of developing the SinnoTest®, a therapeutic guidance device that allows rheumatologists to prescribe the most effective treatment for their patients. 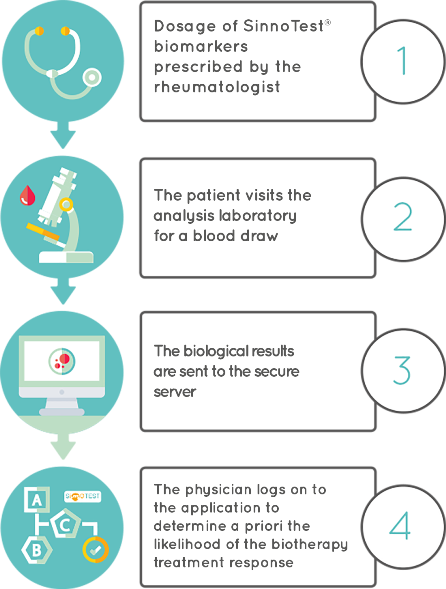 From a simple blood sample, the SinnoTest® is able to determine “a priori” the likelihood of biotherapy treatment response, through the analysis of the patient’s specific protein biomarkers. The SinnoTest® thus enables the biotherapy optimal selection. In order to broaden the use of this practical, economic, ergonomic and predictive test, our objective is the quick launch of this first product on the market.